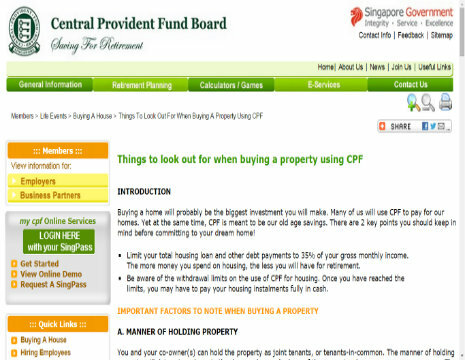 One of the most common uses of the CPF Funds in Singapore is the servicing of mortgage loans for both HDB and private properties. The interest rate in the CPF Ordinary Account has remained at 2.50% p.a. for an extended period of time, while interest rates on mortgage loans had hovered around the 1-1.5% levels. This allowed home loan owners to arbitrage on the 2 rates; effectively making a “profit” by enjoying higher CPF interest rates while servicing their lower-cost mortgage loans. With SOR and SIBOR rates increasing from their low rates to current levels in excess of 1%, it is perhaps time to revisit this : Does it still make sense to hold a higher mortgage amount, or should one pay down their loans with their existing CPF balances? Circumstances will vary among individuals so the first step is to look at the mortgage carrying rate. Action should be taken if mortgage rates clearly exceed CPF interest rates. Otherwise, one can hold back any action. If the mortgage rates exceed CPF interest rates, the next question to address is the amount to be used to pay down the loan amount. Should one use the whole CPF Ordinary Account balance, or is there a magic figure that can be derived? There is no ONE best way.. but the strategy should be flexible enough so that it is able to ride out any life changes. One suggested method is to leave a buffer of 6-12 months of mortgage instalments in your CPF balances. MAS645 mandates that banks use a 3.5% mortgage interest rate when assessing residential property loans so this rate makes a good starting point. Why not use the current interest rate? This is because this rate is not likely to have taken into account any further volatility in interest rates. It pays to be conservative! I once had a client whom I had worked with. She had wanted to have the lowest loan amount over the shortest loan tenure. Through the planning process, I showed her the various strategies she can use to lower the costs of her mortgage but retain flexibility in her loan. With these strategies, we could then have the leeway to have a higher loan amount as well as keep her higher CPF balances, retaining a buffer equivalent to 6 months of mortgage loan instalments. A couple of months after her transaction was complete, I found her one day in my office waiting for me. It was then I found out that she had just been retrenched and had come to thank me for convincing her to keep the CPF buffer! Remember that your individual situation should determine the approach to how you manage your CPF balances. Other than the latter, there are other ways you can take to lower your mortgage costs. Feel free to come to us to explore these strategies. After all, a penny saved is a penny earned!